Policy advocacy is the process of negotiating and mediating a dialogue through which influential networks, opinion leaders, and ultimately, decision makers take ownership of proposed ideas. In Labour Migration Project context this policy advocacy is conducted for allocating sufficient budget in local migration centre. 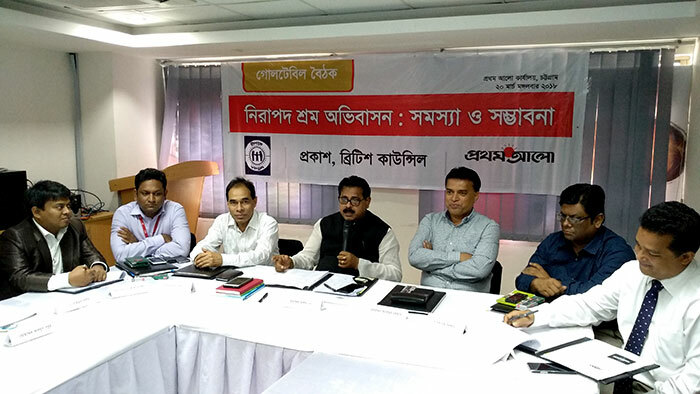 Country’s most prominent newspaper the Daily Prothom Alo and YPSA jointly arranged a roundtable discussion meeting on Policy Advocacy of Resource Allocation of Local Migration Centre, on 20 March 2018. Md. Israfil Alam MP, Chair, Parliamentarians Caucus on Migration and Development, Bangladesh National Parliament. Sabiha Nahar Begum MP, Bangladesh National Parliament. A M M Dilshad, Member, Zila Parishad, Chittagong. Dr. Saifur Rashid, Professor, Department of Anthropology, University of Dhaka. Dr. Amir Md. Nasrullah, Professor and Chairman, Department of Public Administration, Chittagong University. Abu Noman Md. Jakir Hossain, Deputy Director (Passport and Visa Office), Chittagong. Mohammad Jahirul Alam Majumder, Assistant Director, District Employment and Manpower Office (DEMO), Chittagong. Engr. Md. Nazrul Islam, Principal, Bangladesh-Korea Technical Training Centre (BKTTC). Engr. B.M Shariful Islam, Principal, Chittagong Mohila Technical Training Centre. Md. Arifur Rahman, Chief Executive, YPSA. Md. Mahabubur Rahman, Director (Social Development), YPSA and Project Focal Person. Md. Abdus Sabur, Programme Manager, YPSA-Labour migration Project. The meeting was moderated by Biswajit Chowdhury, Bureau Chief Daily, Prothom Alo, Chittagong. Dr. Amir Md. 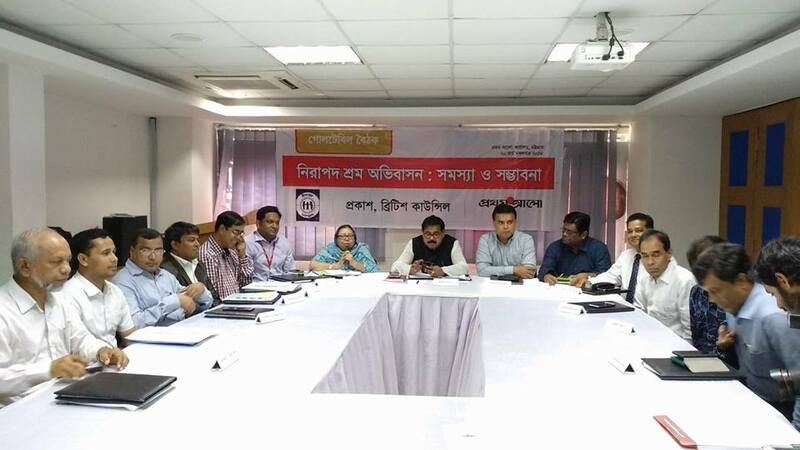 Nasrullah, Professor and Chairman, Department of Public Administration, Chittagong University has presented a concept paper on “Safe Labour Migration: Problem and Prospect” in the meeting. Afterward, the participants discussed that issue. The main objectives of this policy advocacy is to influence the decision-makers on considering the migrants rights and welfare issue in home and destination countries. In addition to put pressure to related stakeholders (service providers DEMO, TTC and Passport Office) with the presence parliamentarian on providing necessary support and recognition to labour migrants. The key note speaker, Dr. Amir Md. Nasrullah, Professor and Chairman, Department of Public Administration, Chittagong University has presented the labour migration history, records, scenario, statistics, contribution of migrants, recruitment channels, impact of labour migration, existing policies and laws on labour migration, initiatives of government on ensuring safe labour migration, YPSA Labour Migration initiatives, achievement, challenges and way forwarding issues. After the presentation of key note speaker, Md. 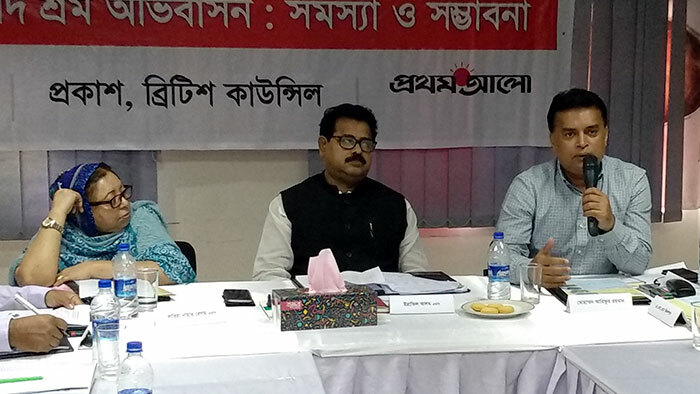 Arifur Rahman, Chief Executive, YPSA has said that YPSA has five development themes and Labour Migration Project has been implementing under the theme of Human Rights and Good Governance. He also said that, YPSA is working on promoting safe migration as well as working on preventing illegal migration or anti trafficking issue. As well as supports on reintegrated to returnee on socially and economically. He made emphasis on formalize the middleman on labour migration process. By the formalization of middleman the accountability and transparency of middleman is being possible. Principal, Female Technical Training Centre (TTC) said that government has established 70 training centres in entire the Bangladesh. These centres are providing training to aspirant migrants. He also expressed they have some bad experiences on sending maid workers in abroad. Mohammad Jahirul Alam Majumder, Assistant Director, District Employment and Manpower Office (DEMO), Chittagong has proposed several suggestion to Parliamentarians Caucus on Migration and Development, Bangladesh National Parliament that, to allocate sufficient budget in DEMO, to extend the services of DEMO, to priority the migrants of DEMO database, to deploy necessary human resources in local DEMO. Md. Mahabubur Rahman, Director (Social Development), YPSA has proposed to establish and functional the welfare wings in all destination countries. The high commission/embassy official make positive behave with Bangladeshi workers in destination country. As well as to regular monitor the services of GAMCA registered health centres in Bangladesh. Deputy Director (Passport and Visa Office), Chittagong has said passport office now completed the biometry registration of 11 lakh Rohingya peoples. He also said the approach of passport office as no report no passport. He also said that to prevent the Bangladeshi Passport of Rohingya people this biometry of rohingya database will reintegrate with central server. Dr. Saifur Rashid, Professor, Department of Anthropology, University of Dhaka has said that Bangladeshi workers are doing 3D Jobs in abroad (D= Dirty, D= Difficulty and D= Dangerous). But they make a significant contribution in our economy. He also said that the rich people are sending money to abroad from Bangladesh whereas the migrants are sending money to Bangladesh from abroad. So, we should be care and serious on migrants right issue. 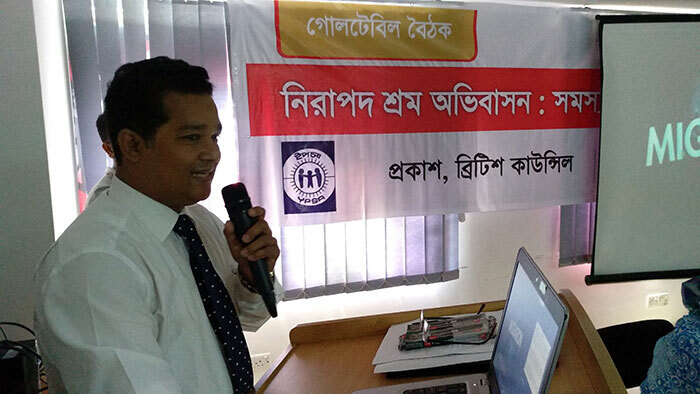 A M M Dilshad, Member, Zila Parishad, Chittagong made emphasis on recognition of labour migrants. He also proposed it should our duty to support returnee migrants on social reintegration process. Md. Abdus Sabur, Programme Manager, YPSA has shared the project experience to invited participants. As well as drawn attention to Chair, Parliamentarians Caucus on Migration and Development of reducing the migration cost, disseminate the information of available services to marginalized community as well as importance on local grievance mechanism on settling the overseas related disputes in out of courts or BMET. At concluding part of discussion, Md. 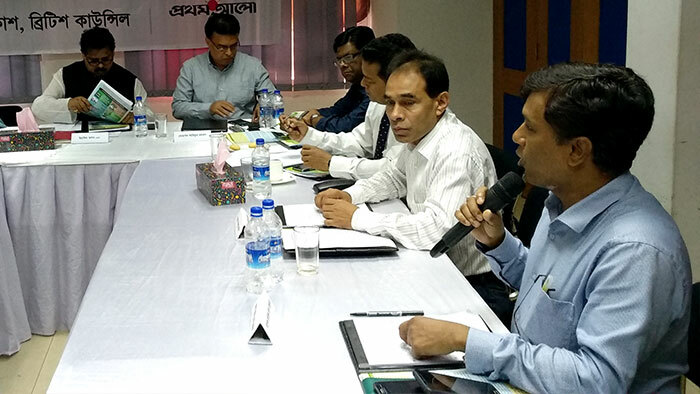 Israfil Alam MP, Chair, Parliamentarians Caucus on Migration and Development, Bangladesh National Parliament has said that Bangladesh Government is now working in all sorts of interventions on promoting The Global Compact for safe orderly and regular migration. He said government has established 70 training centres in entire the Bangladesh. He made emphasized on sending skilled persons in abroad. He also said that migration sectors brings more contribution on Bangladesh economy rather the Garments. He also recognized the contribution of remittance in Bangladesh economy. He also suggested to recruiting agency on deploy staffs at filed to collect the aspirant migrants for overseas. He said all transaction should be electronic no manual transactions will allow in future. He also said that government now being fixing the migration cost to all destination countries. And this process will reduce the migration cost of Bangladeshi workers. He requested to government official and respective channel on working with responsibility and honesty. And requesting to treat migrants are a human beings not a community. Finally, he call for on working together for ensuring the rights and dignity of migrants.